Rue is a perennial shrub that has been used to treat ailments like menstrual disorders and spasms thanks to its medicinal properties. Rue is a small shrub native to South Europe and North Africa. It was reportedly used in ancient Greece and Egypt for treating a wide variety of health conditions, and finally brought to the New World by Spanish explorers. Today, rue is mostly known as an ornamental and commonly found in home gardens; however, its medicinal uses are still valued by herbalists, and scientific research is discovering more potential applications for this underrated plant. Relieving inflammatory pain. Rue has been used for centuries to treat menstrual pain, rheumatism, arthritis and other inflammatory conditions. Reducing the risk of thrombosis. Rue can help prevent the formation of blood clots, strength blood vessels, lower blood pressure, and reduce edema. Other popular applications of rue include its use as an insect repellent and antiparasitic agent. Additionally, preliminary research suggests that rue may help relieve arrhythmia and improve eye health, as well as inhibit some strains of bacteria, such as Escherichia coli and Trichomonas vaginalis. The major active constituents of rue are flavonoids, rutin, quercetin, furocoumarin and lemonins. Rutin -also known as rutoside- plays an important role in preventing the creation of free radicals that cause cellular damage. Besides its antioxidant properties, rutin also acts as an anti-inflammatory agent and a vasodilator, strengthening the walls of blood vessels and relieving edema, which prevents the formation of blood clots and reduce the risk of thrombosis. Additionally, rutin can help decrease cholesterol toxicity, which is thought to be a cause for atherosclerosis. Rue also contains alkaloids, vitamin K, and volatile oils, which hold anti-inflammatory, antispasmodic, analgesic, diuretic, and stimulating properties. RUE HAS BEEN USED FOR CENTURIES AS AN HERBAL REMEDY FOR MENSTRUAL DISORDERS, SHARPENING EYESIGHT, CIRCULATORY DISORDERS, AND INDIGESTION. Herbs well-known for their anti-inflammatory properties are turmeric and devil's claw, while ginkgo and rosemary also promote good circulation and prevent cardiovascular diseases. When used topically, rue can cause allergic reactions. Reported symptoms include redness, blisters, and increased pigmentation. The consumption of this herb in any form can also increase sunlight sensitivity and risk of miscarriage, as well as further reduce low blood pressure. It should be noted that rue can be toxic if taken in high doses, so it is important to consult a doctor before consuming this herb in medicinal amounts. Combining rue with certain drugs can alter its medicinal action. People taking medication for heart conditions, such as digoxin and Dobutrex, as well as any drugs for lowering blood pressure are advised to seek a medical opinion before consuming rue. Rue can also counteract the effects of fertility drugs, and pregnant women should never ingest rue, since it can cause miscarriage. Italians traditionally ate rue in their salads for good eyesight, and rue leaves were used to flavor Italian grape liqueur, grappa. The culinary applications of rue have declined in popularity, but the herb is still sometimes used in Ethiopian, Greek, and Italian cuisine. It is very bitter to taste, so it is usually added to sauces for flavoring. Although not as popular as it once was, rue still provides medicinal benefits in the form of herbal remedies. Raw. The fresh leaves of rue can be applied as a skin antiseptic and a natural insect repellent. Infusion. Both fresh and dried, the leaves of rue can be steeped in hot water and taken to relieve digestive complaints and painful menstruation. Poultice. The fresh leaves of rue can be crushed and applied directly in order to reduce rheumatic pain. Liquid extract. This is a strong preparation that needs to be mixed with water before drinking it to relieve inflammation and encourage menstruation. Tincture. With a base of alcohol, this is another concentrated form of rue that needs to be diluted in water. Essential oil. Few drops of rue's essential oil on a cotton plug cam be placed over the ear in order to relieve earaches. Cream. In this form, rue can be applied topically for joint and muscle pain relieve. Capsules. 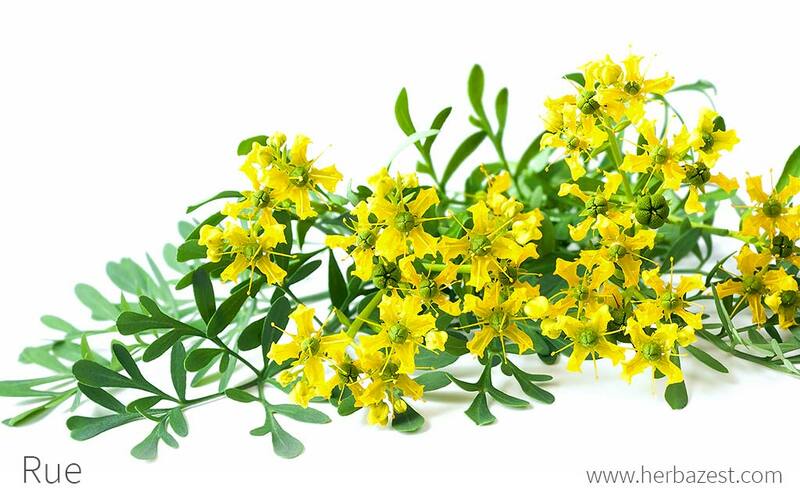 The dried leaves of rue can also be taken as a daily supplement, mainly for the treatment of arthritis, rheumatism, and other inflammatory diseases, as well as for the relief of painful menstruation. Small bundles of fresh rue are commonly sold by herbal vendors. Rue can also be found dried and sold as a spice in some specialty grocery stores. Raw and dried rue is not readily available at most regular markets; however, it may be found at some herbal vendors and specialty grocery stores. While some rue herbal remedies, like infusions and poultices, are easy to make at home, other medicinal preparations, such as rue liquid extract, tincture, and essential oil, as well as rue capsules, are easier to purchase through online retailers and can also be found in local herbal stores. Rue is a hardy plant that can thrive almost anywhere, in a wide variety of soils and climates. However, in order to grow its best, rue will require some basic care and conditions. Rue plants do best with full sun and dry conditions. They can grow in a variety of soil types, but prefer well-drained soil. However, it can even do well in rocky, dry soil with scarce watering and no external fertilization. Rue can be propagated through both seeds and cuttings, and will require as little as 1.6 feet (0.5 m) of space between plants. A rue plantation will provide optimum yields for up to ten years before foliage production begins to diminish. It is recommended to wear gloves when handling rue, because its sap often causes rashes and skin irritation. Rue is a woody, perennial shrub with a strong aroma that grows about three feet (1 m) in height. It has bluish-gray leaves with small, yellow flowers. Rue is considered indigenous in South Europe and North Africa, but it is now cultivated in many parts of the world. Rue, or Ruta graveolens, is part of the Rutaceae family, which contains a wide variety of aromatic plants, which grow mainly in tropical regions. The name of rue's botanical genus, Ruta, is derived from the Greek word reuo, which means "to set free," because the herb was thought to be effective in treating diseases. A closely-related species, Ruta chalepenis, is also native to the Mediterranean region, and can be used to get rid of worms, promote menstrual flow, and soothe sore eyes. The first records of rue medicinal and culinary uses can be traced back to ancient India and Iran, and mentions to the herb appear in various classical texts of both Ayurveda and Unani medicine. Ancient Greeks and Romans, also held rue in high esteem. The reputed physician Dioscorides listed over a dozen topical uses for the herb, and Pliny regarded rue leaves infused in wine as a powerful antidote for fungi, snake bites, rabid dogs bites, and scorpion stings. During the 14th century, rue was an ingredient in Four Thieves Vinegar, a beverage thought to prevent the bubonic plague. The alleged benefits of the herb were so many that Renaissance visual and plastic artists, such as Michelangelo and da Vinci, consumed rue in order to improve their vision. Spanish explorers are believed to have introduced rue into the Americas, from where it quickly spread to the rest of the world. The ancient Greeks used to burn rue or take baths with the infused herb for protection against witches and evil spells. This tradition persisted during the Middle Ages and, even nowadays, rue is still believed to bring prosperity and good luck in many cultures around the world. Another common name for rue is herb-of-grace, and comes from the Catholic tradition of using a rue brush to sprinkle holy water during the mass. While rue is not the most well-known herb, it is produced and purchased for various reasons. Rue is used as a culinary additive for flavoring, as an ornamental garden plant, and for its essential oils. Rue is easily grown worldwide, so no significant industry has been developed for profit. Cosmetics. Rue extract is used for fragrances, soaps and other personal care products. Gardening. Rue is a popular ornamental, not only because of its unusual blue-gray colored leaves and bright yellow flowers, but because it repels garden pests, such as flies, mosquitoes, beetles, slugs, fleas, and cats. Germplasm Resources Information, Ruta graveolens L.